Arbitrage: Another Reason Why Mergers & Acquisitions Fail? I’ve seen a couple of good movies in the last few weeks (look for some posts on them in the upcoming days). In this post, I wanted to talk a bit about one of those movies: Arbitrage. It came out this past year and stars Richard Gere (and Susan Sarandon). In fact, Gere is up for a Golden Globe for his performance. The movie really reminds me of a movie I saw around this time last year: Margin Call. It’s not hard to see why — they’re both about Wall Street and some of the transgression that may lead to turmoil. 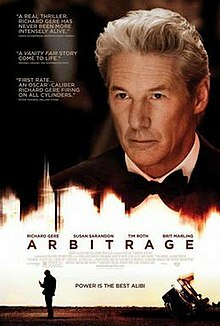 In Arbitrage, Gere is a financial wizard who is in the process of selling his firm (that he built from the ground up to a $600 million business). In amongst this, there are affairs, murder, lies, cheating, scandal — just about everything you’d expect in a good movie. While clearly a movie, some of these plots don’t seem out of the realm of possibility for actually happening (in real life). The one thing that I found the most telling was something towards the end of the movie. Now, it’s going to spoil the movie, so this is where I’m supposed to say “SPOILER ALERT.” If you don’t want the plot ruined, you should definitely bookmark this post and come back to it after having watched the movie. You can watch it on Amazon right now! Okay — so this is what it was: as the acquiring CEO is on the way to the gala, his right-hand man hands him a piece of paper that points out that Gere’s character’s firm has a $400 million shortfall. The CEO says something to the effect of, “what do you think?” And right-hand man says, “It’s all right there.” And then the CEO says, “I don’t see anything.” And then the CEO smiles at the right-hand man. It’s often written that mergers & acquisitions fail and there are plenty of reasons why this is the case. Managerial hubris being a key culprit. However, after watching Arbitrage, I wonder how often it happens that the acquiring firm learns about a firm’s “cooked books” after acquiring it and then has to “sit on it,” or else the stock price would take a major hit.